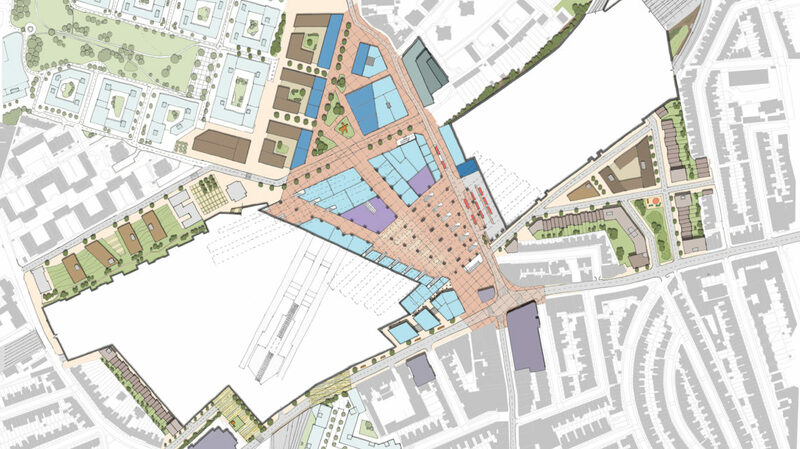 Author: Cyril Richert & David Curran The architectural practice Hawkins\Brown has unveiled last week their vision for Clapham Junction’s future. 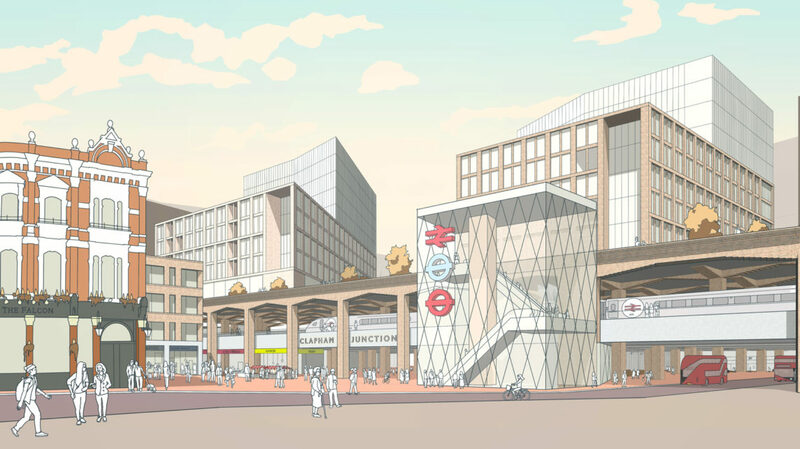 Their website reports work on a vision for the future of Clapham Junction, examining how an integrated approach to development can offer significant benefits to both the station and the wider Battersea area. 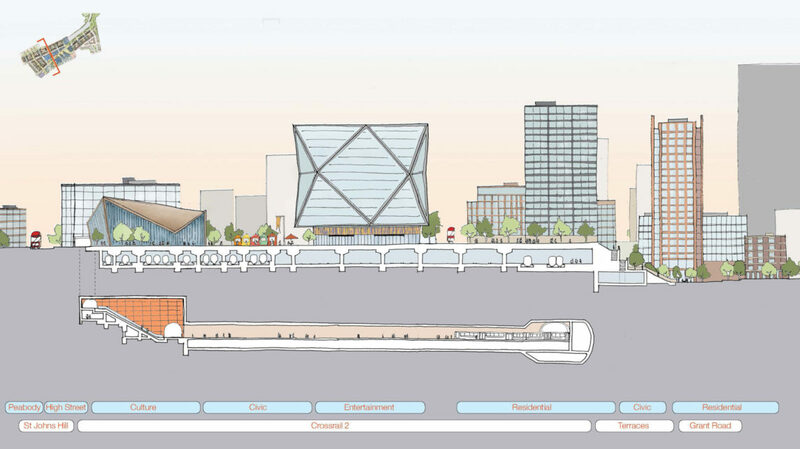 The plans were developed by consultants Mott MacDonald, contractor Laing O’Rourke and architect Hawkins Brown, and is at this early stage more of a concept of how things could look, rather than the final masterplan of what will be built, according to the well informed ianVisits blog. 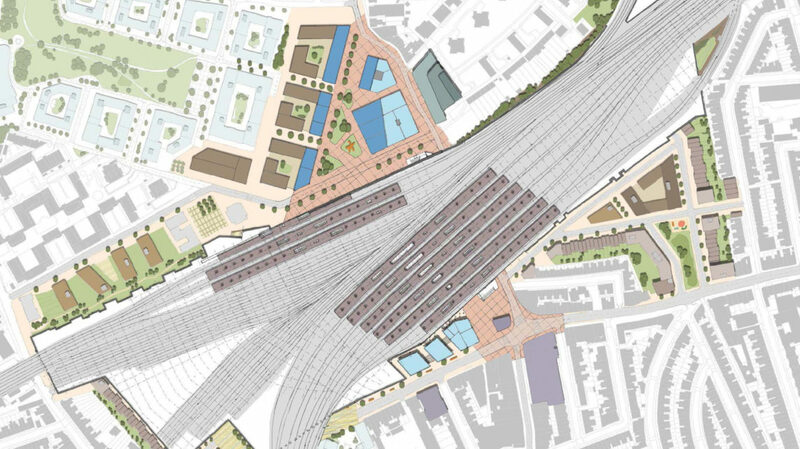 This study might have been triggered by recent announcement from Network Rail about the possibility of a full redevelopment of Clapham Junction station, involving the closure of the subway but going further and building a new deck over some of the tracks that could accommodate further development and substantially improve access to the station. 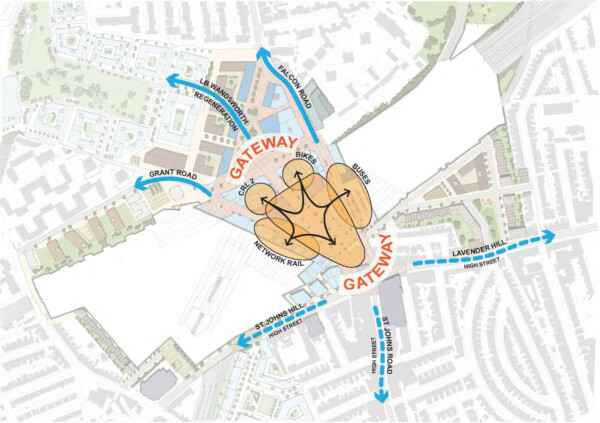 It’s certainly an ambitious vision, including several new (pedestrianised) routes over and under the station, a large pedestrian square above the tracks with connections to St Johns Road and Grant Road – but also Falcon Road and Plough Road – and access to the platforms from various points in the new square. The project as displayed on Hawkins\Brown’s website seems to address the six main issues that we either discussed with Network Rail or that we mentioned independently in past articles. Escalator: When we had a meeting with Network Rail back in January, they explained that any new access resulting from a closure of the current subway (currently the shortest way to join any platform) should provide a broadly similar facility, minimising the time to access the platforms. And based on the recent development at London Bridge (pictured above), escalators to the footbridge from a redeveloped concourse seem a reasonably likely approach. 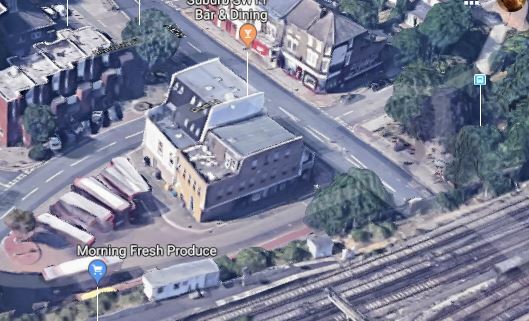 The concept study suggest that a new entrance could be built where the current PCS building stands in Falcon Road (which also presents an opportunity to start the work without major disruption on the other entrances of the station (St John’s Hill, Brighton Yard and Grant Road). 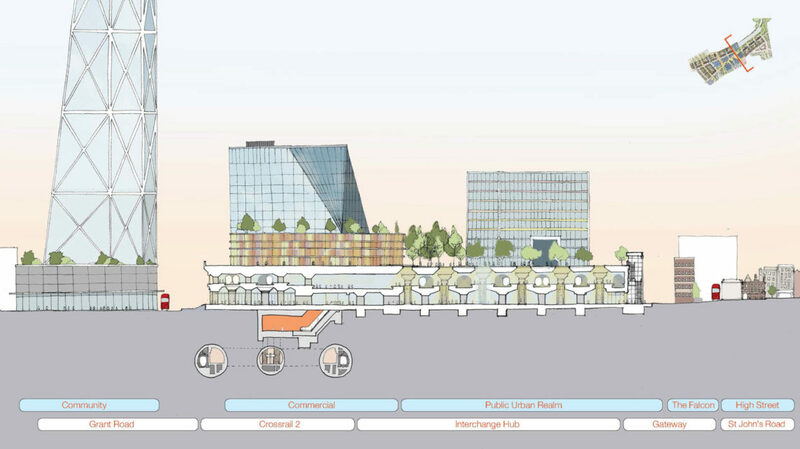 A much wider concourse: Following CJAG’s campaign against the 42 storey towers proposed in a previous redevelopment project nine years ago, we presented alternative ideas for the redevelopment of the area. 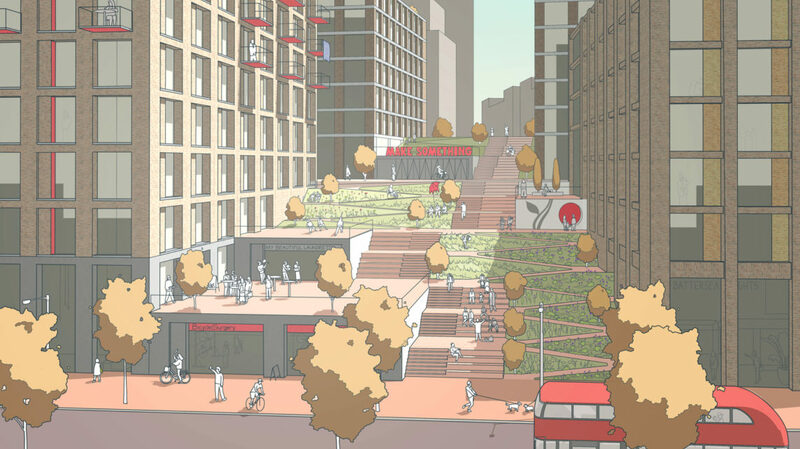 One of our proposals was for a wider concourse, and this forms part of the Hawkins\Brown masterplan (which also includes a much wider concourse, waiting area, and escalators up to the platforms). Decking the tracks: Building a deck above the tracks with buildings above is an increasingly popular option in situations where major railway stations need big upgrades to their capacity – and where space is constrained. Speaking about Waterloo station last year, Network Rail stations director Norrie Courts said that a deck built could in the long term provide both development opportunities and congestion relief. By creating several new ways across the station at the upper level and underneath the tracks, this is also an opportunity to unify the ‘Falcon Road’ side of the station with the wider town centre. 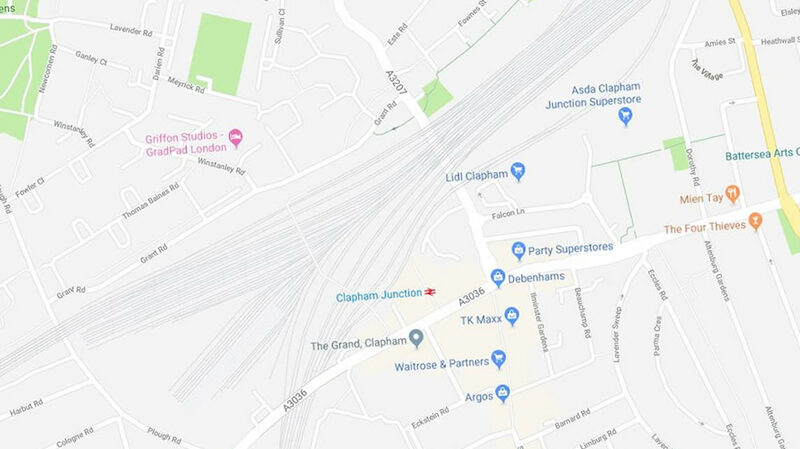 According to IanVisits’ blog, tracks and platforms would also be straightened in order to allow more trains through the station and create extra capacity – both at Clapham Junction itself and across the south west. During those works, it’s likely that four additional temporary platforms would be constructed on land that is bought to the south of the current station to keep the trains running. Falcon Bridge: Last January we reported on the fact that nobody realy likes the Falcon Road railway bridge. If not disappearing completely, the images show a complete make-over with new pillars. In addition, because the tracks will be covered, it won’t be the only access to Grant Road/Winstanley Estate. More links between both sides of the tracks: Back in December 2008, Peter Deakins, a local resident and CJAG’s member, presented alternative views to the redevelopment of Clapham Junction, with efforts to reduce the barrier that the railway creates between North and South Battersea. This aspiration seems also to have been properly considered within the Hawkins\Brown’s project. 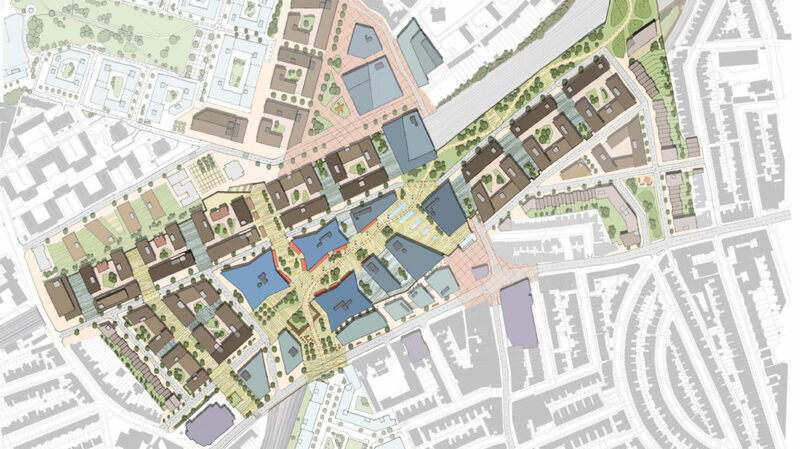 Site Allocation (2009 version, p85): high-density mixed-use development with retail/commercial uses to ground floor with residential uses to upper floors would be considered. […]. Tall buildings may be justified in this location [and] these would be best located towards the railway frontage to reduce their impact on the residential area of Mossbury Road, and the conservation area. 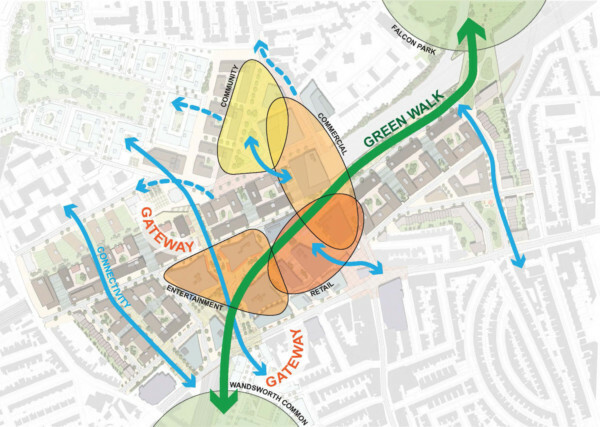 The proposal presented by Hawkins\Brown seems to address this issue, with scope to realign roads and – buy combining railway land and the existing relatively narrow site – create better-proportioned development sites. OAK Trading (which developed the Travelodge hotel at 155 Falcon Rd) objected that any new residential development above ground floor level would surely need south facing windows which could harm the amenity of the houses in Mossbury Road (although there could be some mitigation by offering extension of existing properties by land purchase). It is often said that a picture is worth a thousand words, so here is a global view of the project, with below the corresponding map of the area (as it is currently). 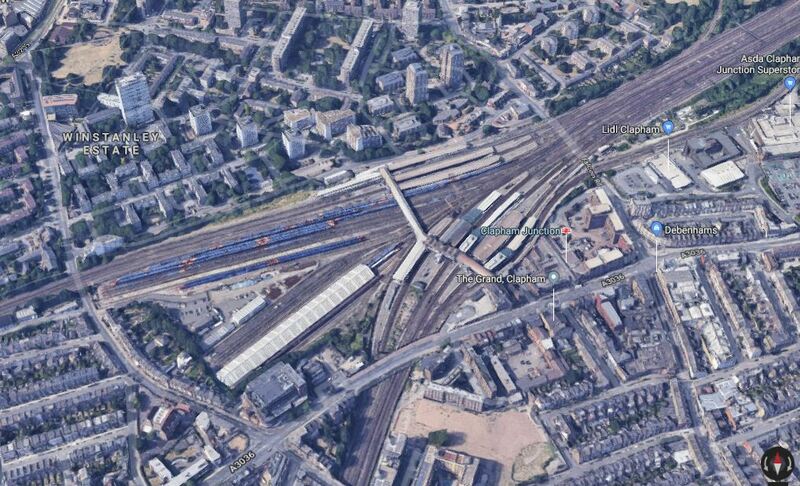 A development along these lines would represent an intensification of the density on the south side of the station, of what is currently mainly an area of Victorian terrace houses from the late 19th century. 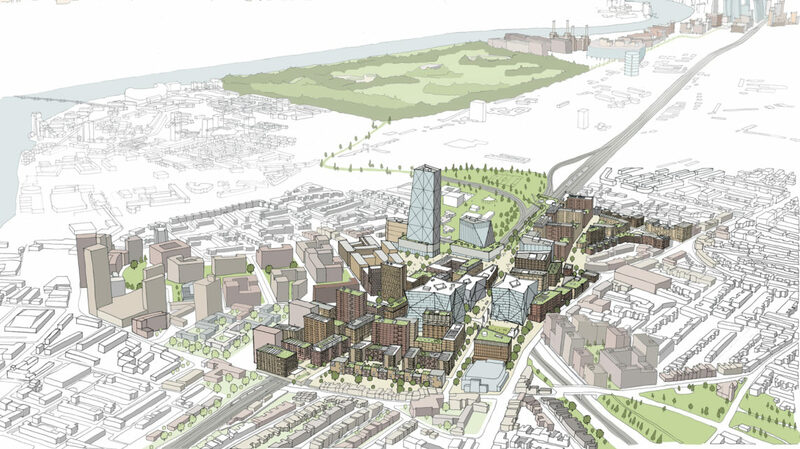 Although the proposal carefully presents a graduation within the size of the buildings (with smaller buildings along St Johns Hill, and taller ones towards Grant Road), several blocks at the centre of the deck would reach 15 to 20 storeys, with the biggest tower of about 40 storeys located at the current site of the old people house and Suburb SW11 pub. However this would be in line with the draft London Plan 2018 and the inclusion of Clapham Junction as an opportunity area. There’ll be some way to go before any proposals start to turn in to concrete planning applications – in other words, no-one living or working in or near the proposed development area should worry that major development is imminent. But we have long recognised that the station needs an overhaul, and are pleased that Network Rail are putting serious effort in to exploring what may be feasible. It’s important that we are all involved in major local projects, and will continue to monitor this development and keep you informed. 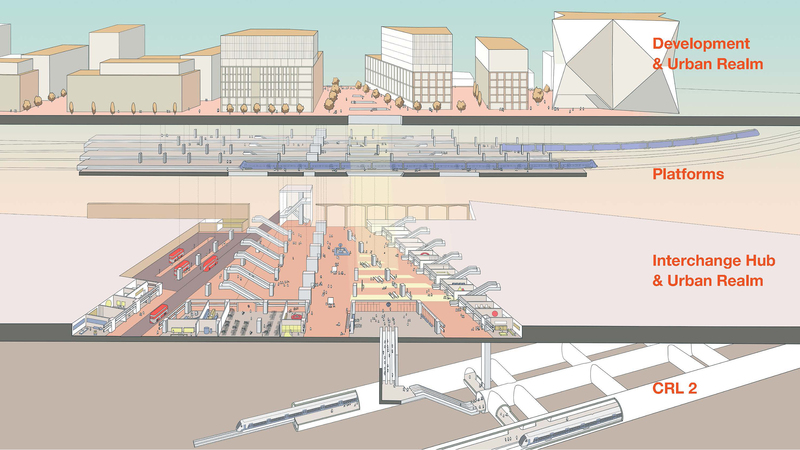 This shows how the platforms would be straightened, and be extended to have a more consistent length to accommodate longer trains.